Is this UK's most gentrified street? House prices in desirable areas of British cities have rocketed, changing some inner-city communities beyond recognition through the process of "super-gentrification". Across some areas of the UK, streets that once housed poor people are now beyond the means of all but the well-off. The path to gentrification is clear when modern streets are compared with maps created by the Victorian social researcher Charles Booth a century ago. It's particularly obvious in Portland Road in London's Notting Hill. There are the multi-million pound houses, three-stories high, without so much as a curtain out of place. There's a beauty spa, a wine bar and a gallery selling artworks that cost tens of thousands of pounds. It's hard to believe it used to be one of the worst slums in London. The Secret History of Our Streets is on BBC Two, Wednesday 27 June at 21:00 BST. Back in 1968, when Tim and Penny Hicks bought the dilapidated 157 Portland Road for £11,750, the latter's mother was shocked that they had chosen to move their family from up-market Chelsea into an area more known for rag and bone men than bankers. 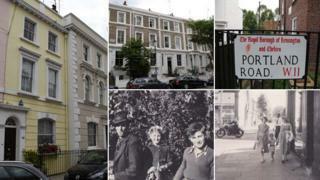 Forty-four years later, their house is now worth more than £2m. "I should think we were the second or third of the settlers," Penny Hicks says. "At the local primary school, one of the teachers when we were being shown around, said to me, 'You do appreciate Mrs Hicks, this is not working class. This is criminal class.'" The houses on Portland Road were built in the 1850s on waste land between the downmarket Norland estate, home to the squalid piggeries and potteries, and the fancy new Ladbroke Estate, which became Notting Hill. Maps created by Booth in 1899 show how two-thirds of the residents of Portland Road were classified as poor. By the time Booth's map was updated in 1929, the residents towards the northern end of Portland Road had moved into a different category: "Degraded and semi-criminal". Houses slipped into multiple occupation and became run down, with shared toilets and no bathrooms. The Hicks' future home at 157 Portland Road was one of those. It was where George Andrews lived with his family. There were eight of them in two rooms, paying a rent equivalent to 65p per week. "Portland Road was a slum as far as other people were concerned. As far as we were concerned, it's where we lived," Andrews says. "When you look back, we lived in a shack. We lived terrible. "They [the landlords] weren't getting two pounds a week rent from the house, so they did no repairs, they did nothing. My dad was offered that house for £300 - my dad had never seen £300 in his life." The abolition of rent control in 1957 was meant to encourage investment in property. But it led to ruthless landlords - like the infamous Peter Rachman - trying to cash in on the now lucrative housing market by bullying tenants into leaving. It triggered the gentrification of Portland Road and was the beginning of the end of the street's working class community. "As well as all these various rent acts and housing acts that impacted gentrification, it was also the fact that a new group of people, a new middle class emerged in society in the 1950s, who didn't want to live in the suburbs," says Loretta Lees, a professor at Kings College London, and gentrification expert. "The suburbs were boring, they were bland, they were full of suburban families with two children. People wanted to live close to work, they wanted to live close to cultural facilities, like theatre, museums and art galleries." The Hicks family still live on Portland Road, but many of the other original gentrifiers sold their houses to a new generation of exceptionally rich buyers. It's a "super-gentrification", that has been fuelled by city bonuses and wealthy foreigner investors, says Lees. Instead of the traditional view that the wealthy take flight from cities, Lees says the reverse seems to be happening in London, with the rich living in the centre of the city and the poor being displaced. Portland Road offers a prime example of how gentrification changes the make-up of an area. These super-gentrifiers, she adds, are different to the pioneer gentrifiers, like the Hicks family who sent their children to the local primary school and engaged with the existing community. "Many of the early gentrifiers believed very strongly in comprehensive schools. They believed that their children should be mixing with poorer children and that their aspirations etc would rub off on those children, but also that their children would learn from these other children," she says. Prime Minister David Lloyd George spoke of "homes fit for heroes"
"And now the whole discourse has changed as gentrification has become more hegemonic." The one part of Portland Road that was never truly gentrified is the northern end, where social housing replaced run-down tenement buildings that had housed brewery workers. Built in the 1930s, Winterbourne House and Nottingwood House are just a few hundred yards from properties worth millions of pounds. Flats cost an average of £340,000, compared with the average price for a house at the southern end of Portland Road of £3.5m. A deprivation map produced by Kensington & Chelsea Borough Council in 2007 showed that while some of the top earners in the country live in the southern and central parts of Portland Road, some of the lowest 5% live at the north end. Like other super-gentrified areas, middle income buyers - who can't afford houses worth millions of pounds and aren't eligible for social housing - might struggle to move into the area. When Andrews went back to visit the street where he was raised, there wasn't much left to remind him of how Portland Road used to be. The sweet shop had gone, the dairies had gone. Even the Portland Arms pub had been turned into a beauty spa. The Hicks' gutted his old home at 157 Portland Road and turned it into a house worth millions. Although he's nostalgic, he has no doubt that leaving Notting Hill changed his and many of his neighbours' lives for the better. "You moved out of one of those dumps and got a council flat - you've got a bathroom, you've got hot water, you've got central heating. Can you imagine that? After living in a dump like that? They couldn't wait to move, some of them. "Not because they didn't like the area and the people. It's just that they were bettering themselves. They were coming up a step."